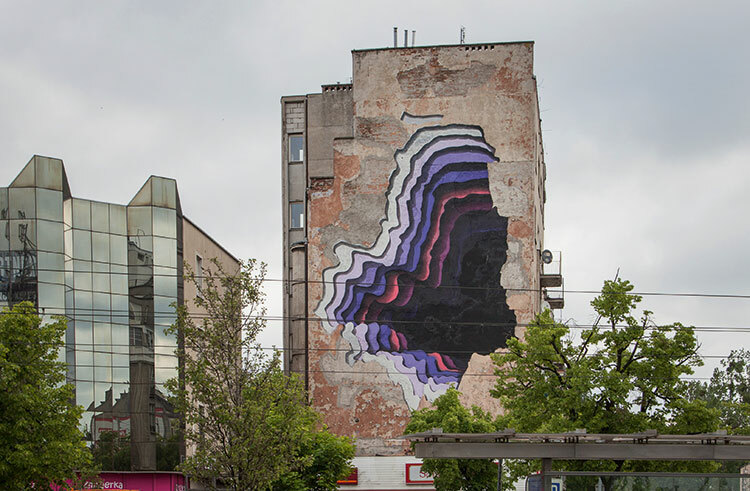 For so long kept stony silent, the walls of Warsaw are speaking up, channeling the voice of the wider community through the medium of art. Loaded with relevant messages and subliminal meaning, the gargantuan works that have been splashed onto the sides of buildings are transforming the city, and nowhere more so than the gritty side streets of old Praga. 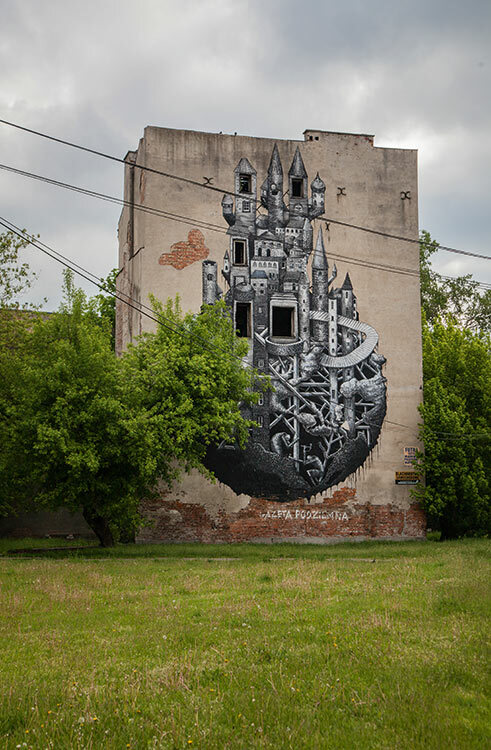 Castle (Mińska 12) Acting on the invitation of the 2013 Street Art Doping Festival, Sheffield-based artist Phlegm created what many cite as being their favorite mural in Warsaw. Complex and mystifying, his intricate masterpiece depicts a castle floating on a planet maintained by downtrodden minions. Making full use of the building he used as his canvas, the structure’s windows have been integrated into the artist’s Kafkaesque vision. Playground (Stalowa 51) The work of Ernest Zacharevic, Playground was added to Praga in 2015 as part of the Street Art Doping event. 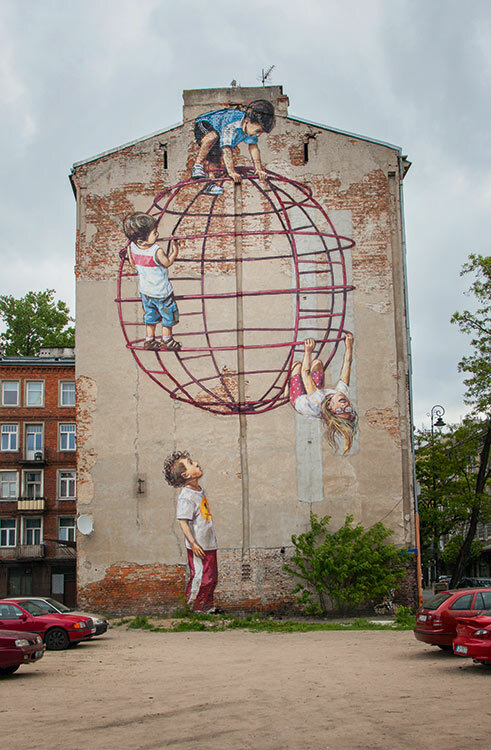 Showing a group of children scaling a globe-shaped climbing frame, the mural aims to draw attention to Warsaw’s lack of urban planning. “Back in the old days,” explains the artist, “there was a proper play area in the patch of land in front of this building – now though, there’s nothing.” The idea for the artwork came about when Zachervic noticed local kids mucking around in the wasteland, making the most of what little their meagre surroundings offer. Warsaw Fight Club (Środkowa 17) The creation of Irishman Conor Harrington, Warsaw Fight Club blurs the boundaries between classic and contemporary art. 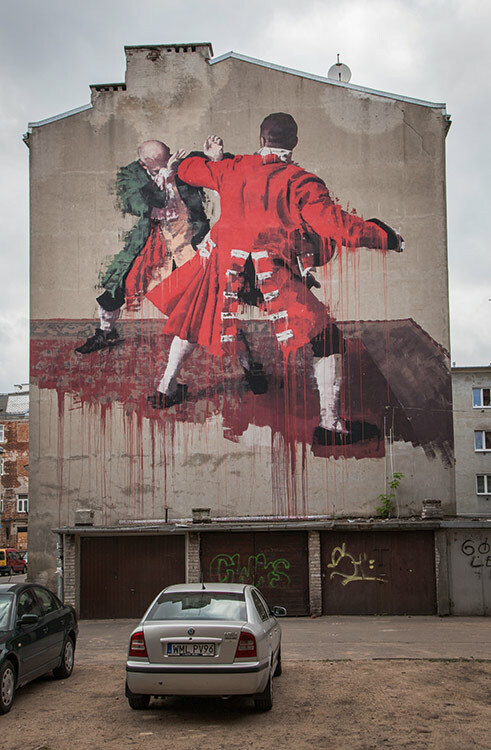 Painted in the space of three days, the work presents a pair of colonial-looking chaps engaged in an epic fist fight. “I paint brawling men,” says Harrington, “because I want to demystify the classical art which tends to portray these kind of figures as being elegant and statuesque. By presenting them in direct physical combat I wanted to show the harm they are capable of.” While Harrington’s work has been internationally acclaimed, local councilors have raised concerns that his imagery could encourage street violence. Bird & Snake (Bliska 23) It took one day for the Chinese artist DALeast to paint this strangely unsettling mural. Composed of several thousand tangled strands, these brittle-looking wires mesh together to form the image of a bird perched on a cobra. Both creatures project an air of pride, dignity and defiance, and it’s not unknown for the dark intensity of this work to cause passing motorists to slow suddenly. That this moody mural fills the role of a speeding deterrent is unintended; its true purpose was to instill respect towards wildlife. Find it in close proximity to Dworzec Wschodni bus station. 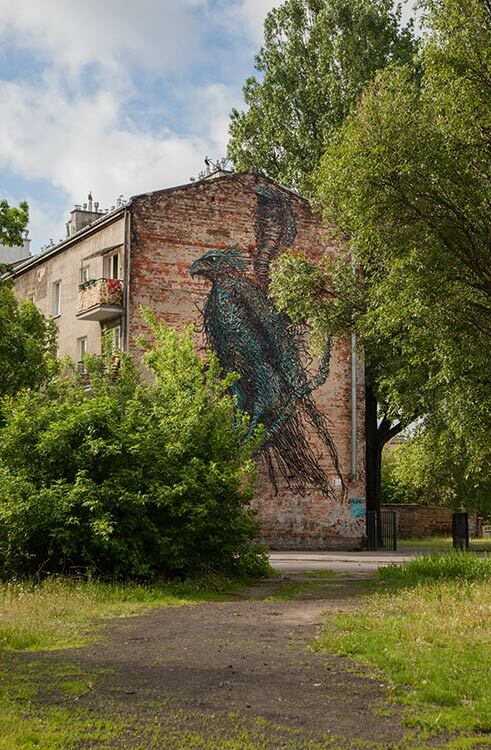 Goose (Brzeska 14A) Possibly the most upbeat out of all of Warsaw’s murals, Praga’s giant goose dates back from 2012. Added at a time when the city was counting down to the European Football Championships, Diego Miedo’s project aimed to show local kids that rather than loitering around the gates of the National Stadium, they could do something actually useful with their time. 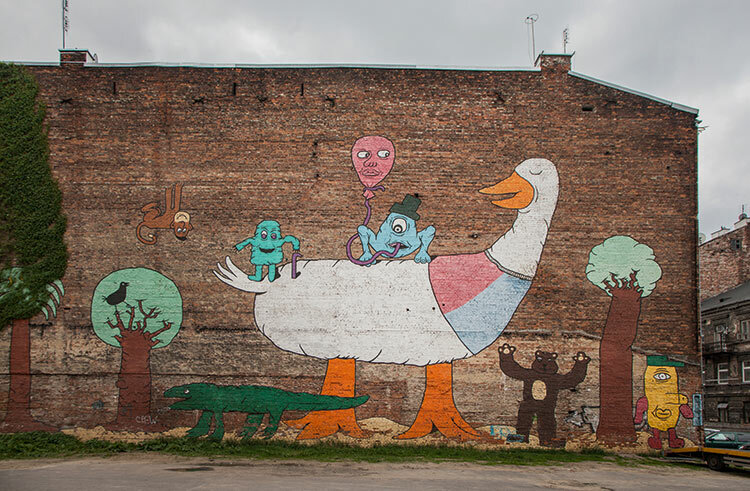 Also hoping to illustrate that Warsaw street art can go beyond vandalistic scrawls, Miedo was joined by dozens of schoolchildren who helped with the design and realization of this jaunty endeavor. Highlights include an upside monkey and a jolly-looking bear poised in mid-rargh. The castle is gone (together with the building). But at Stalowa 51 youll find another very impressive piece! Greez!